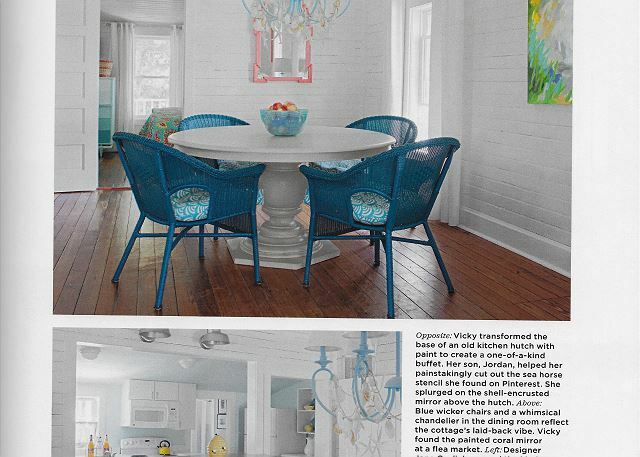 Our home is a 1930's raised cottage that was recently restored and professionally decorated with the guidance of renowned preservationist and designer, Jane Coslick, whose work has been featured in many magazines such as Coastal Living and HGTV. 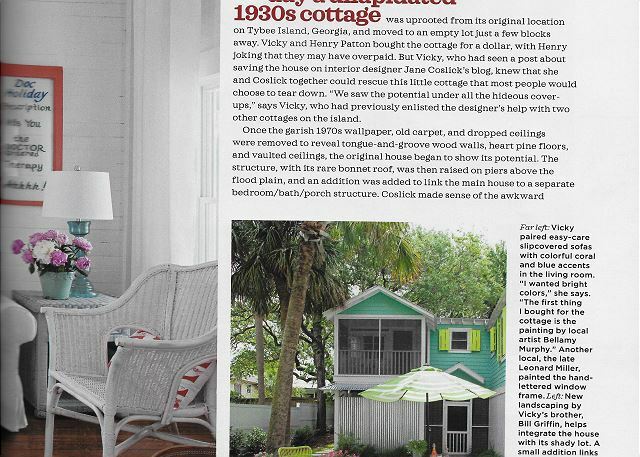 In addition, this charming cottage, named Doc Holiday, has recently been featured in Cottage Style magazine. It has been brought into the 21st century with modern comforts and conveniences without sacrificing the charm of an earlier era. Doc Holiday has a fully equipped kitchen, laundry room, 2 master bedrooms with king-size beds and adjoining bathrooms and there is a bunk room with 4 beds. 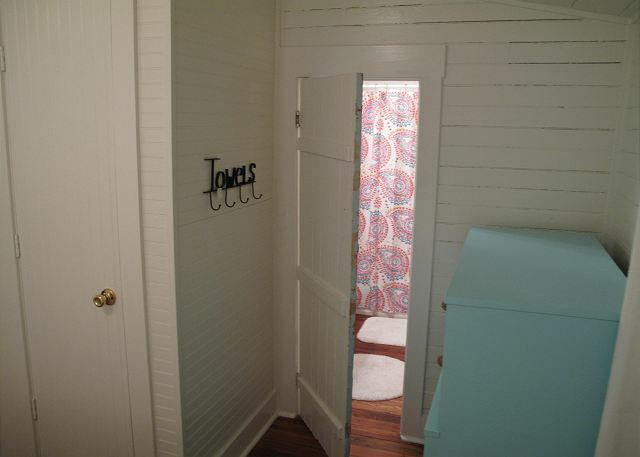 There is a half bath in the hall and a private outdoor shower with hot and cold water. The living area and dining area are open floor plan with original paneling painted white on the walls and vaulted ceiling. There is seating for 6 around the dining table and 4 at the bar and there is a seashell chandelier hanging over the table. There are TVs in the two master bedrooms and in the living room. Outside on the screened front porch there is a sofa, wicker chairs and a table with 4 chairs where you can watch the world go by. There is a great breeze and nice views of the park next door and the shady street out front (it is a bike path for the island). At night turn on the twinkle lights for a soft glow. There is a brick patio with seating and a gas grill for cooking up some juicy steaks or succulent, fresh, local seafood. 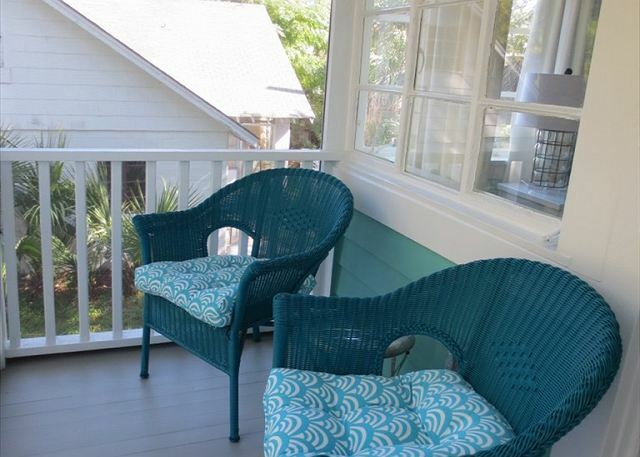 There is also a screened porch next to the patio with a table and 8 chairs. It's a very short walk to the ocean and we have a beach cart at the cottage for our guests to use. There are some chairs and people have left some beach toys so all you need to do is load them up along with your picnic and head out for a day of surf and sun! Or you could drive into Savannah (20 minutes) for a day of sightseeing in one of the world's most beautiful, historical, romantic cities and then come home for a sunset stroll on the beach. 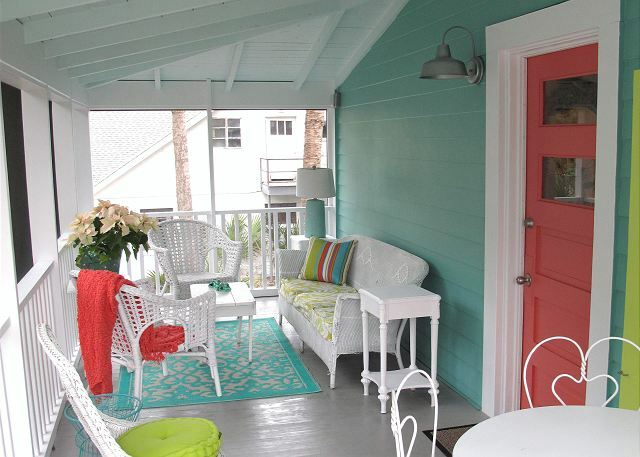 One of our past guests described their stay at our Tybee cottage as "magical" and that's what we hope for you as well! Let the magic of this laid-back, quirky, artsy little beach town relax and rejuvenate you! It's exactly what the doctor ordered--you'll just say ahhhh. "This House was ADORABLE - from top to bottom. On a quiet street, next to a park, and the bike trail, restaurants nearby...Beach one Block... It was HEAVEN - wouldn't have changed a thing. And Jim Heflin that manages the property was the nicest!!! Loved him!!! We will be back. " "The Doc Holiday Cottage was absolutely amazing and the online photos do not do justice! 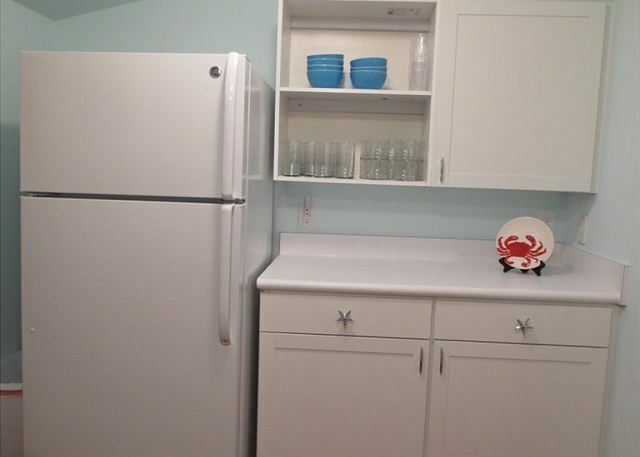 It is very roomy and spacious as well as clean and stocked with everything you need for cooking! 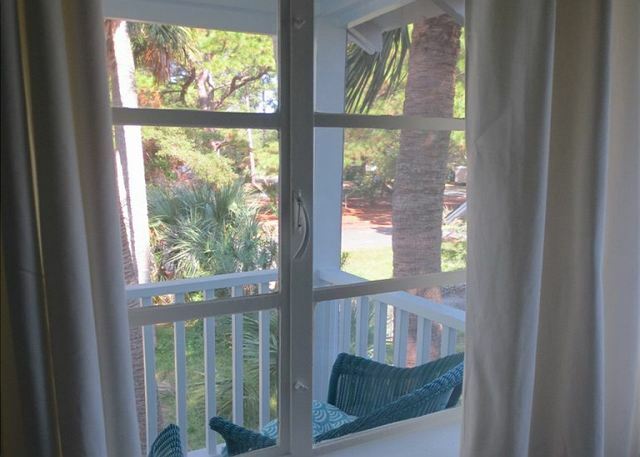 The screened in porch was our favorite place to sit the minute we woke up and right before bed! The location of the house is perfect too. 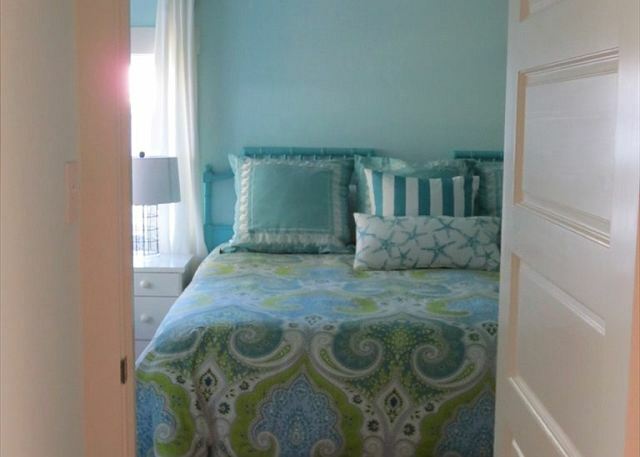 Walking distance to the beach, coffee, ice cream and much more! I would highly recommend this cottage to any family! The property manager Jim, was an extreme pleasure to work with as well! " "The home was wonderful we had everything we needed very comfy beds to sleep on and everything was in walking distance "
"I cannot say enough good things about our stay at the Doc Holiday Cottage! First and foremost the place is adorable! You can tell that whoever decorated this cottage put great care into it. The kitchen was well stocked and comfortable to cook in (we had Easter dinner here). The beds are not your run of the mill cheap mattresses. They are nice, soft and good quality. In fact, my husband wants to change ours at home to what they have. The location is perfect for kids - the park is across the street! (bring your own basketball/volleyball/soccerball) and my personal favorite the screened in porch with the couch. It was perfect for early morning coffee and late night wine! Enjoy, we certainly did! " "We think the Doc Holiday house is perfect! Great location, can walk to beach and restaurants. Park right across street for kids. The home was clean and had everything you need. We loved the decor and absolutely will be back. " "Loved this house! Excellent living area and screened porches! Can't wait to return. " "This is our third stay. Here is why: clean, sleeping arrangements allow for privacy and good size for our group, location perfect for beach or other activities, has all we need (kitchen especially) to not dine out every meal, and it is laid back. " 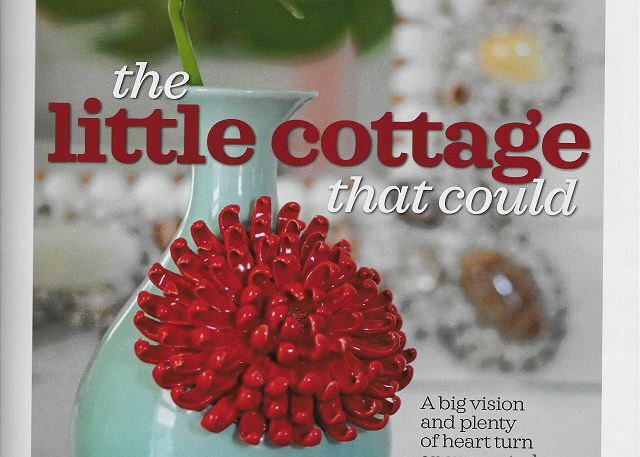 "Cottage was beautiful inside and out. 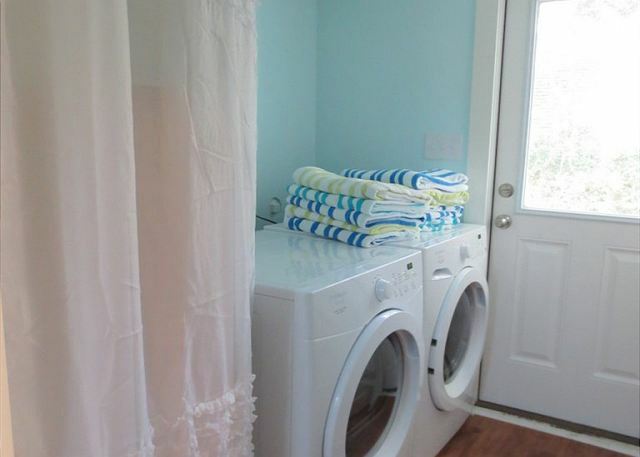 Very clean rental with all the comforts of home. 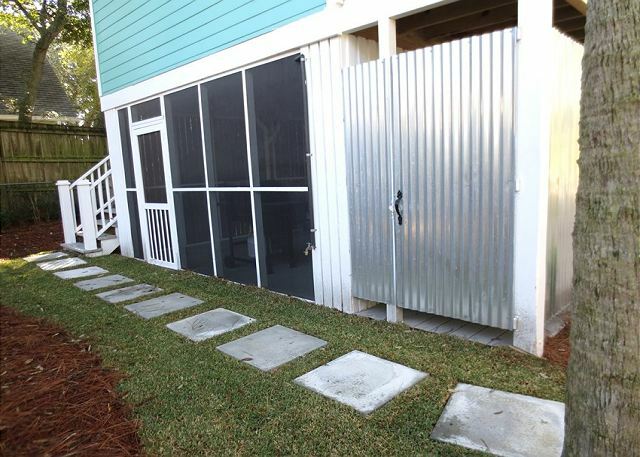 Great location close to beach and restaurants. Would definitely recommend. " "The cottage was clean and spacious. We loved sipping on coffee and wine on the front porch and enjoying time with family. The location is ideal. 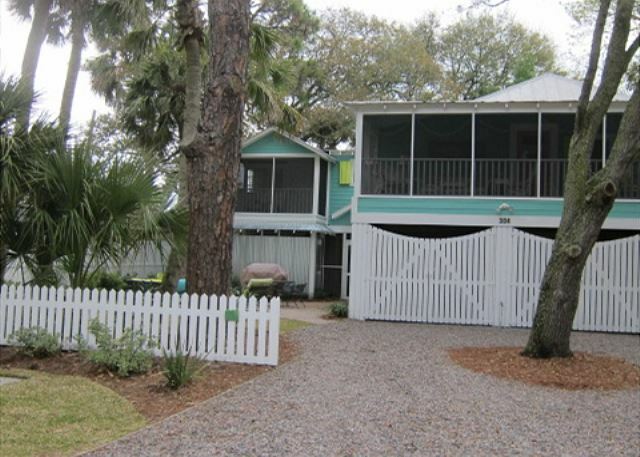 The beach is an easy walk and there are great restaurants down the street and a short drive into Savannah. "The most peaceful, relaxing vacation. 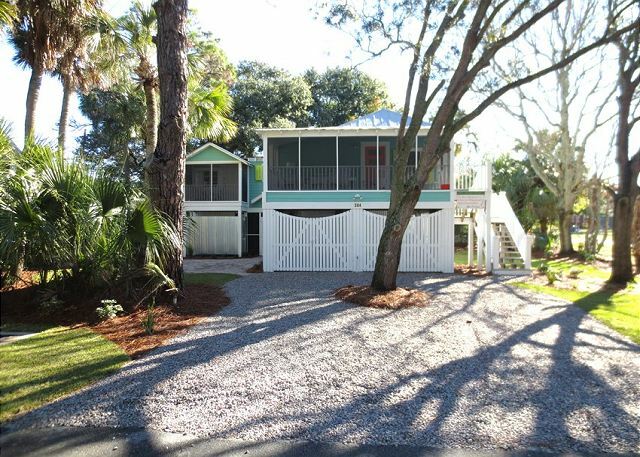 Started with Jim and the ease of the rental, went on with the well appointed cottage, and finished with all Tybee has to offer. We love the proximity to everything. Renting bikes means you never have to get in your car. The simple things are the focus: family, friends, beach, and good food and drink. The layout of the cottage means four adults and two kids had ample personal and communal space. Looking forward to a return visit! " 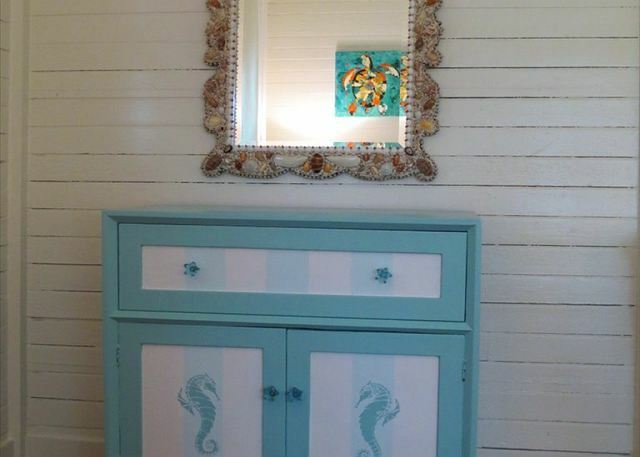 "The most perfect beach mini-vacation for my two daughters, two granddaughters and myself! 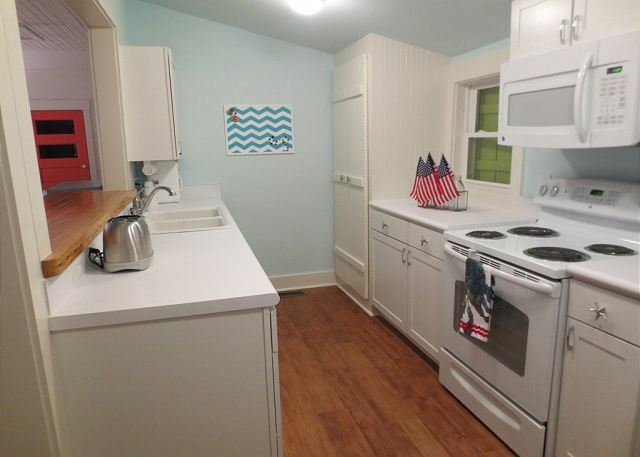 The house is exactly what we were looking for!It's more adorable than the description says! But we think anything that has Jane Coslick's stamp on it is just about perfect! She knows her colors and where they work. When we arrived we noticed how spotless the house was. The layout of the house is great. I decided while there that I could live in this house forever, that's true of any of the houses. 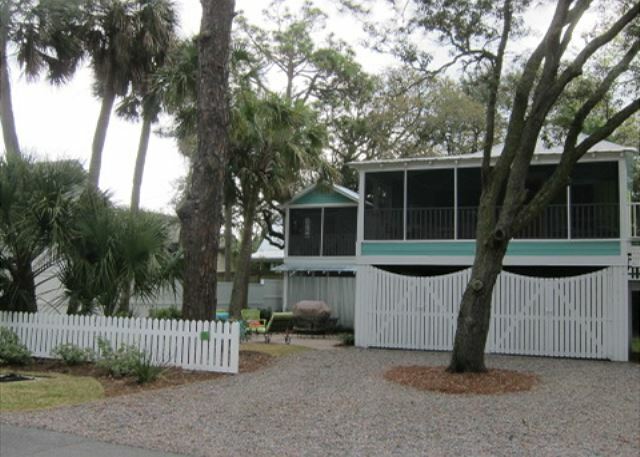 Jim, with Tybee Vacation Rentals was the best to work with...Thanks! Will see you soon hopefully!!" "Excellent. A Labor Day activity did bring in some difficult noise issues across the street. We reported them and they eventually abated. Otherwise, it was great! See you in 2016! " "The rental was comfortable and the decor was exemplary. 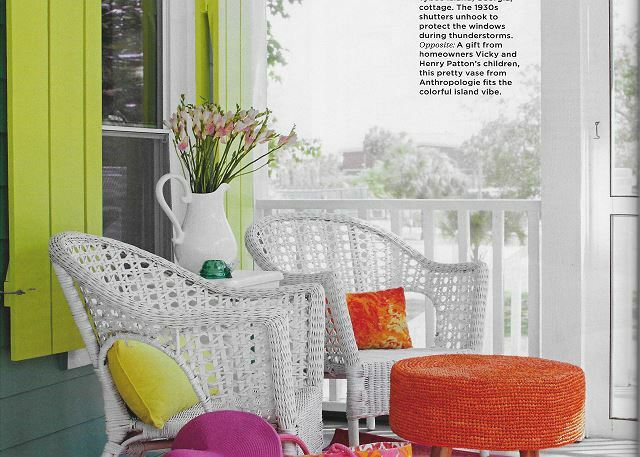 Loved the screened porch. Great location. One toilet didn't work but able to share the others. Everything top notch, great beds, nice touch with beach towels. Loved Sundae Cafe. 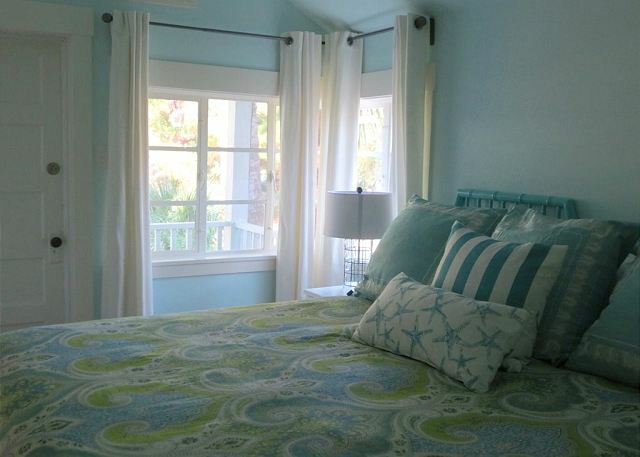 Walking distance to ocean and to restaurants. Short drive to Savannah. Enjoyed Bonaventure cemetary,historic Savannah and beach." 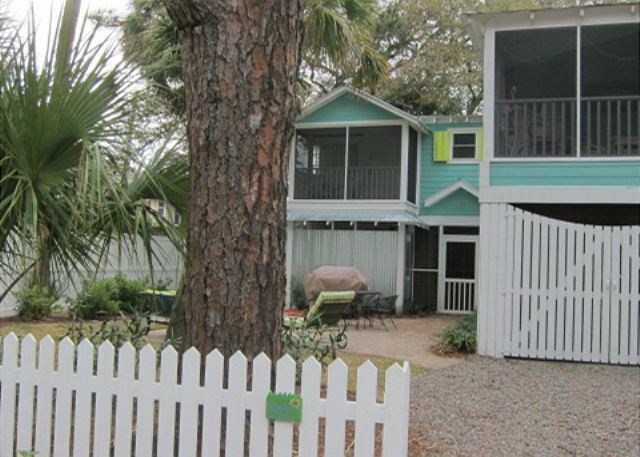 "Our family stays on Tybee as often as we can and this was the BEST cottage that we have had the pleasure to rent! 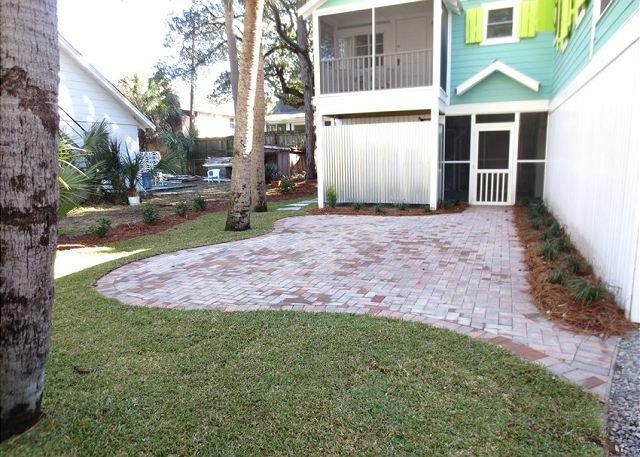 Perfect proximity to the beach, grocery and park. The interior layout was ideal, with all the necessities, plus much more. The porch is adorable and was probably utilized the most. Another plus is having two king beds, nice linens and great quality mattresses!! " "Loved Doc Holiday cottage!! Beautiful, fully equipped, great location:)"
"We loved that every inch of the Doc Holiday Cottage was both functional and precious. Well stocked and thought out in design and function. Screened in porches were wonderful, beds were comfy and kitchen was fully stocked. Beach access was an easy walk with no cost for parking. Loved the decor and would love to live in this home year round!! Perfect for a great getaway and we plan to stay here again." "We have rented the Doc Holiday cottage twice - each for a week. We had excellent stays both times. The house is spotless and is beautifully decorated. Clean enough to put you at ease, but not so fancy that you can't kick your feet up on the cocktail table. Ideal spot for relaxation. 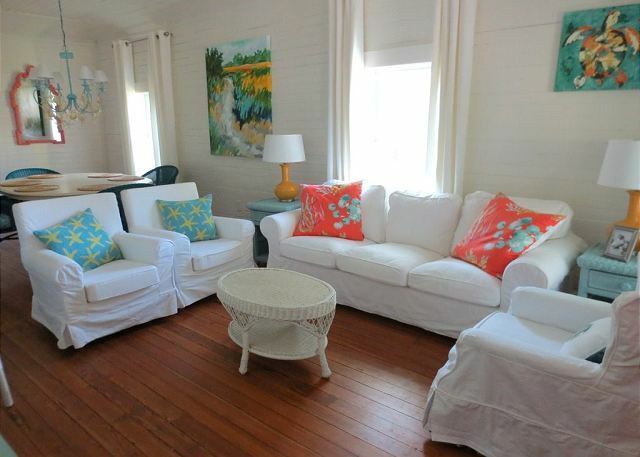 Excellent location - great for lounging around at the beach or taking day trips to Savannah. Loved the outdoor shower, the good sized kitchen and the overall layout of the house. We were surprised to see the house had gotten even better in year 2 with new outdoor furniture and additional kitchen amenities (hello crockpot!). Jim at the agency was responsive, organized and helpful (even when we locked ourselves out...he brought us keys). And the place was immaculate. " "Doc Holiday was a great place to relax. Our kids loved the bunk beds & monkey. The walk to the beach took about 5mins. Sunrise is a must see. Cottage was a great place to hang out with the family after a long day of play can't wait to stay again!" "We had a wonderful time. We stayed the week of 7/5-7/13 with my husband, three boys and my Husband's mother. Everyone loved their personal space. 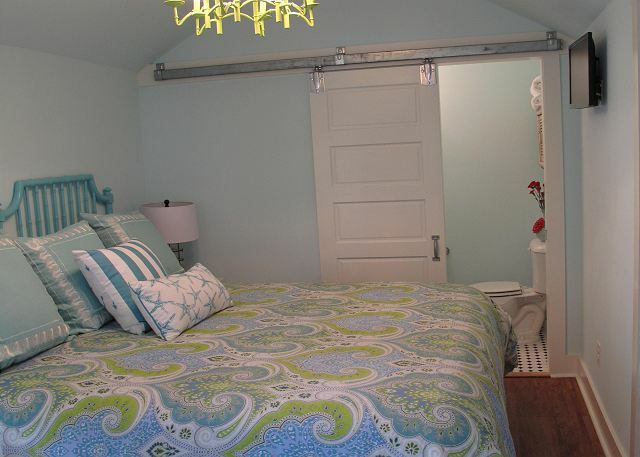 We have three boys and they loved the bunk room - they used the outdoor shower and the hall bath so it was perfect! My MIL loved her special suite with her own private screened porch - she read out there every night. 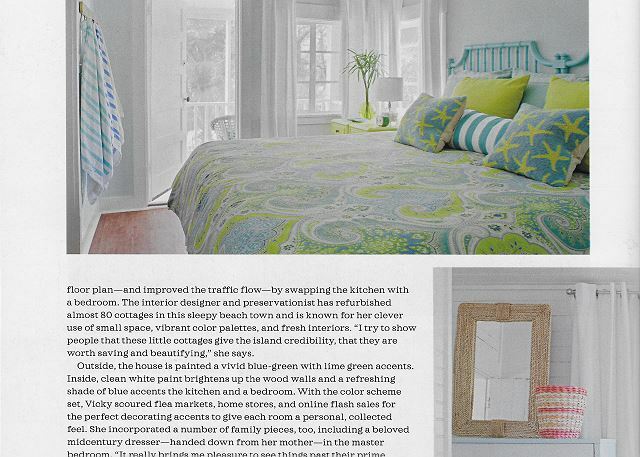 The Master Bedroom with the nice bath was perfect for my husband and myself - a great cozy cottage! The house felt like home and we were truly sad to leave. The kitchen was perfect - we had everything we needed- loved the big pot for our Low Country Boil! We lived on the screen porch every night - we enjoyed having the twinkle lights on and watching the bikers and golf carts go by. Perfect spot for a post beach cocktail and relaxing reading! The house was meticulously maintained. 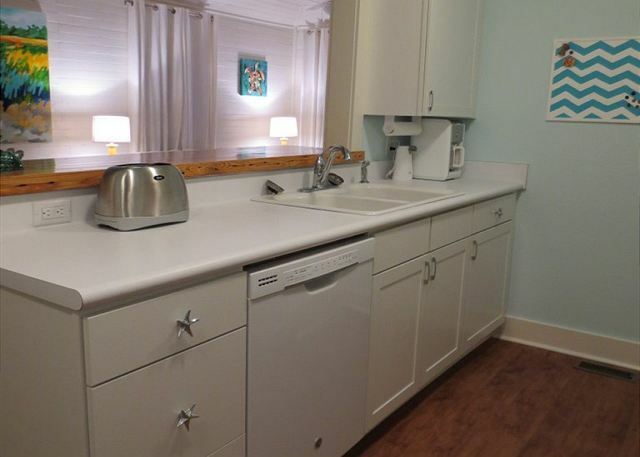 It was spotless and every need was taken care of immediately by Tybee Cottages. Jim Heflin was a pleasure to work with!! We hope to get back very soon!! "We had the privilege of staying at Doc Holiday's cottage for 5 nights in August. From the initial planning phase, Jim Heflin was extremely helpful when we were trying to pick a cottage that best suited our needs. The cottage was absolutely perfect. It was stocked with everything we needed & more. The beds were so comfy. The beach decor was quaint and inviting. A very short walk to the beach and we found that our side of the beach was not as crowded as the pier side which was great. We did not want to leave and would've stayed another night if it had not already been booked by another party. We are already planning our return for next year. Thank you for an absolutely perfect family getaway." "We loved Doc Holidau and Tybee Island! 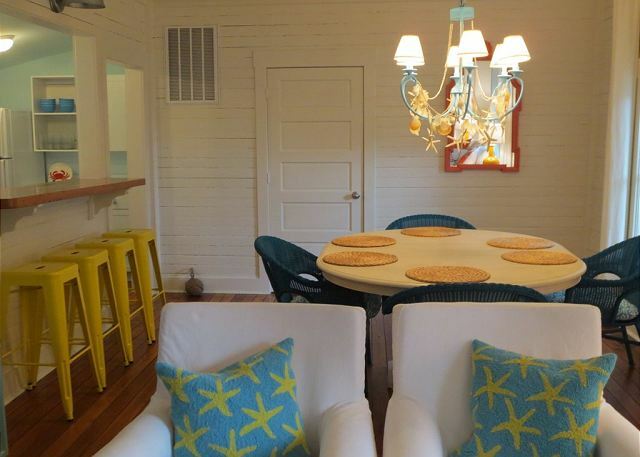 The house is beautifully decorated in classic Tybee beach colors. The screened porch was perfect, and there was lots of room. It's about a 5 minute walk to the beach. Easy to manage. The property manager was so helpful." 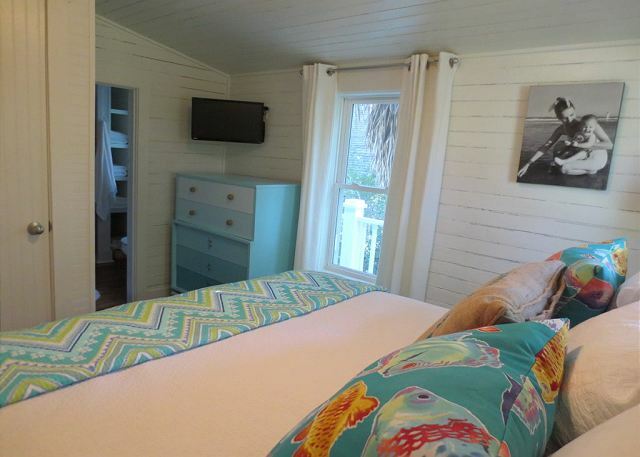 "Doc Holiday is, in our opinion, the absolute perfect vacation rental. The decorating is gorgeous. It's three blocks to the beach - and chairs are provided! Restaurants within walking distance. The picnic table under the house. The grill. The screened-in-porch. The comfy beds. The outdoor shower. We had an absolutely phenomenal stay. Any tiny issue we had Jim Heflin dealt with rapidly and with good humor. We are already trying to plan a trip back for next year. We're in love with Tybee, Savannah, and especially with Doc Holiday. " "Our Girl Scout troop really enjoyed the cottage. The bunk room was perfect for the girls to sleep in. 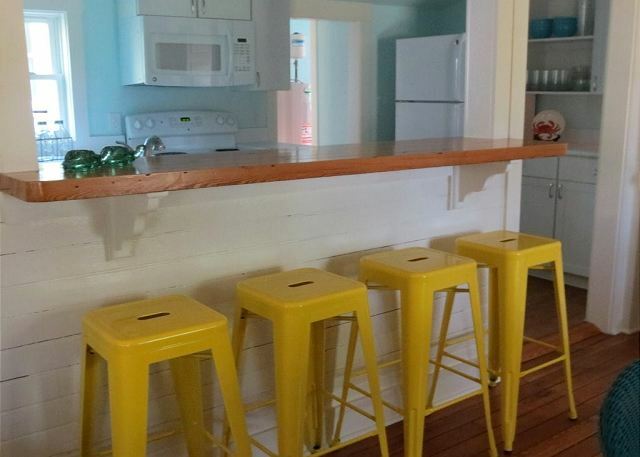 It had everything we needed to prepare meals in the fully equipped kitchen and location to the beach was great. Nice quiet area and we even had a black cat that visited us at least twice a day that was very friendly. Front porch was nice to sit out on and had plenty of seating for everyone as well as the small outside patio area. " 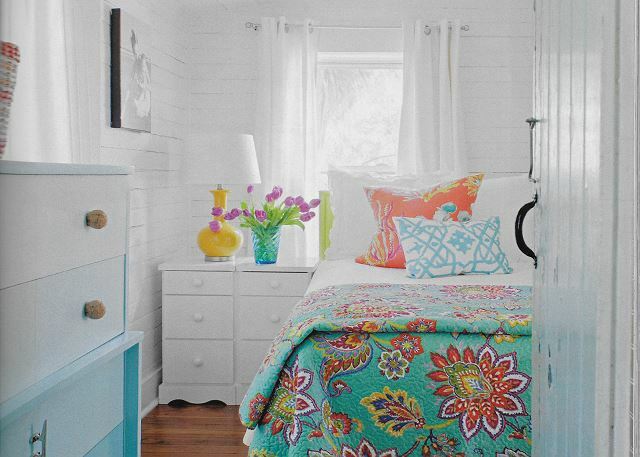 "This cottage was adorable! 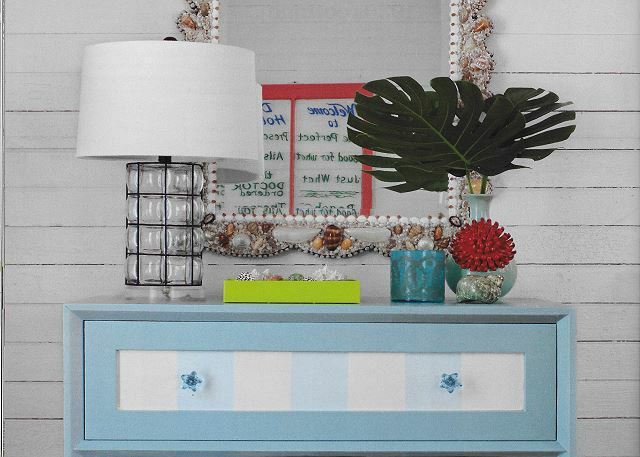 We loved the beach colors and decor. 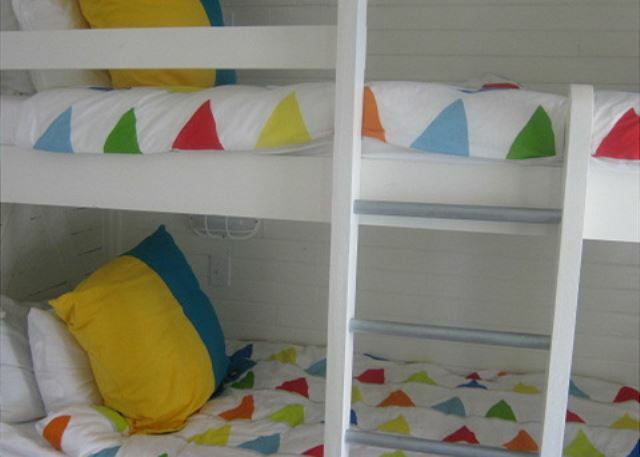 The beds were comfortable, bathrooms spotless, and amenities perfect for our little group of friends and family! The front screened porch was a fun place to have our morning cup of coffee. 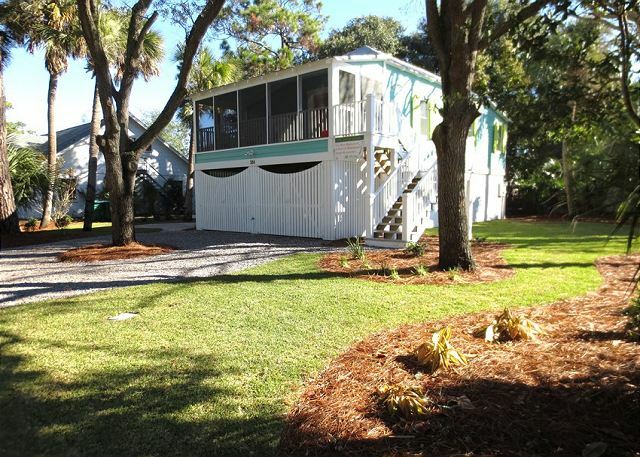 Great location to enjoy the Tybee beach (very short walk), and convenient for day trips to Savannah and other Golden Coast locations. (We went to Cumberland Island National Seashore on one of our days). We would highly recommend this great cottage!" "The cottage was a wonderful retreat for our week away. Weenjoyed beach days, kayaking, trips into Savannah and most of all we loved returning to Doc Holiday to cook meals, read, and relax. We can't wait to return next year!" 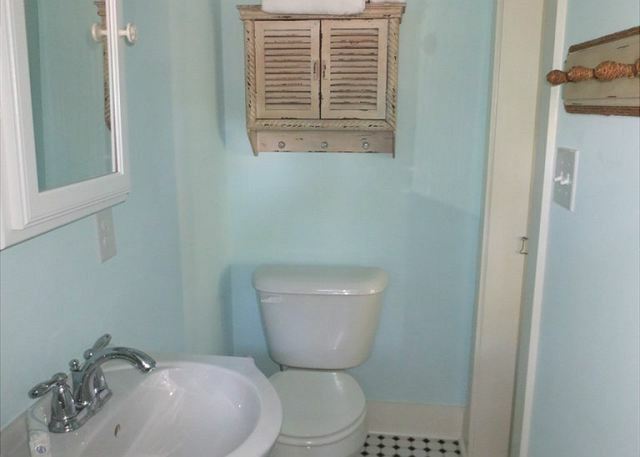 "This cottage is lovely with so many quaint details. It was so clean and tidy. The kitchen is well appointed. The linens we nice and soft and the towels were plentiful. We traveled with young children and they loved the bunk bed room with the individual reading lights. 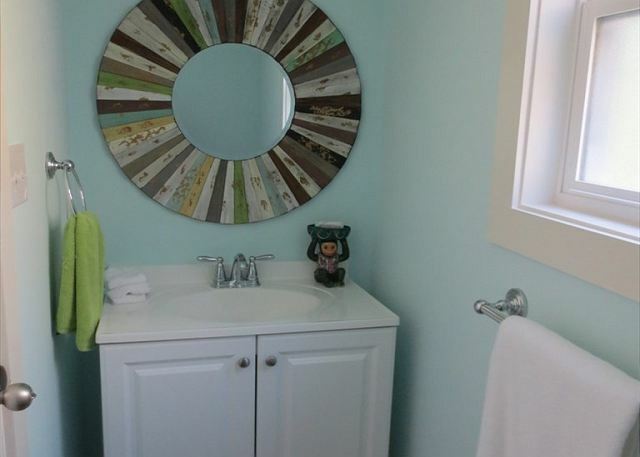 The other two bedrooms were both great- it is nice they each have their own bathroom. The screened porch is excellent to relax on. The cottage is right next to a park, on a bike route and very close to the beach. The management company was accommodating with our requests and quick and friendly in all communications. We were very pleased with everything and will consider returning again if we come back to Tybee. " "We were more than satisfied with our stay at Doc Holiday. We were in serious need of some R&R and this home was PERFECT!! Spotless and very comfortable with some provided extras that we didn't expect. Would definitely recommend and would love to stay here again in the future!!" 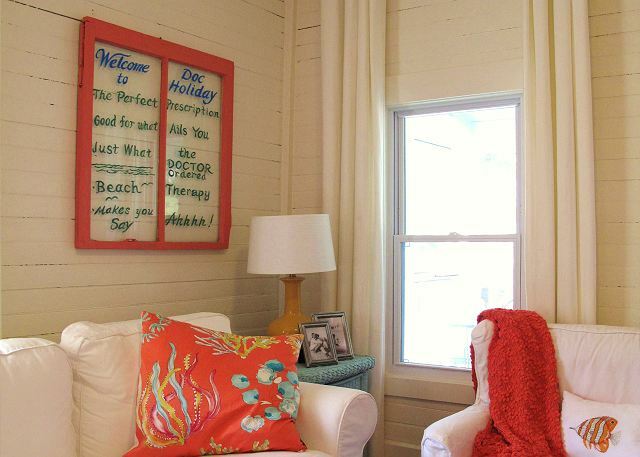 "Doc Holiday was the cutest beach house with lots of personality! The owners have done a very nice job decorating and making it comfortable for its guests! I hope to rent the same house in the future. " 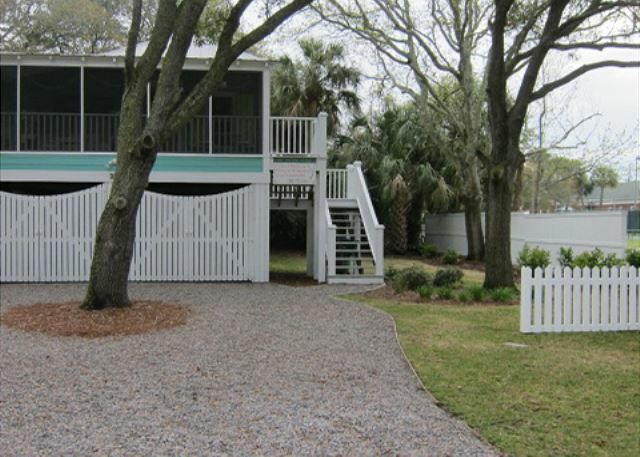 "My wife and I were able to spend a long week-end on Tybee. 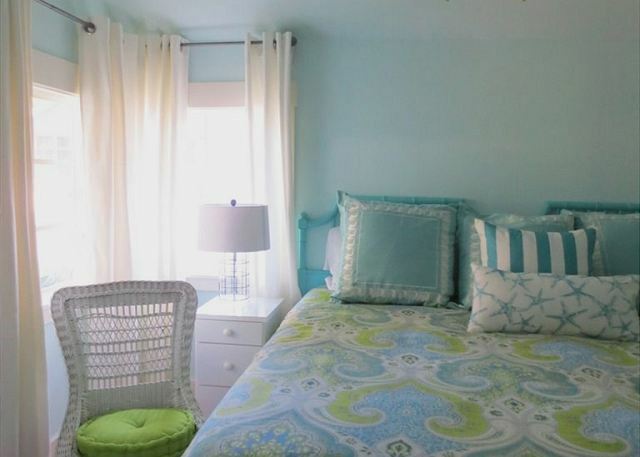 This is a very comfortable house convenient to the beach and a The Sundae Cafe. We will definitely be back and will bring the whole family." "What is there NOT to say about the Doc Holiday Cottage. We couldn't have imagined a better place to stay for our 10 year anniversary and we can't wait to go back and bring the kiddos along as well. 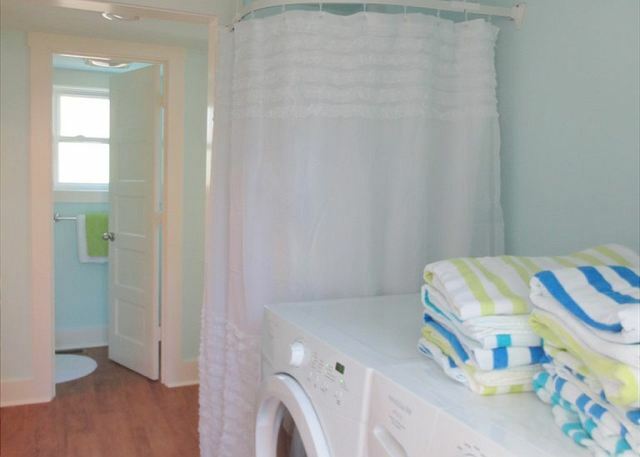 The cottage was VERY clean and the towels smelled so good. There was even fresh cut flowers awaiting in the vases. The beds were very comfy. The cottage was very nice and decorated from top to bottom. Every detail has been thought about and done so nice that it makes you feel at home. Another great thing that we were surprised with was the parking. We were able to park our jeep with the top and doors off and lock it in the under part of the cottage. The outdoor grilling area and shower are very nice. Overall I can't tell you how impressed we were with the cottage. To top it off the property manager was VERY nice and we were VERY happy with the service we received. We can't wait to return to the cottage. Thanks again for a wonderful 10 year anniversary." "Our family of 7 recently celebrated a birthday weekend at Doc Holiday. 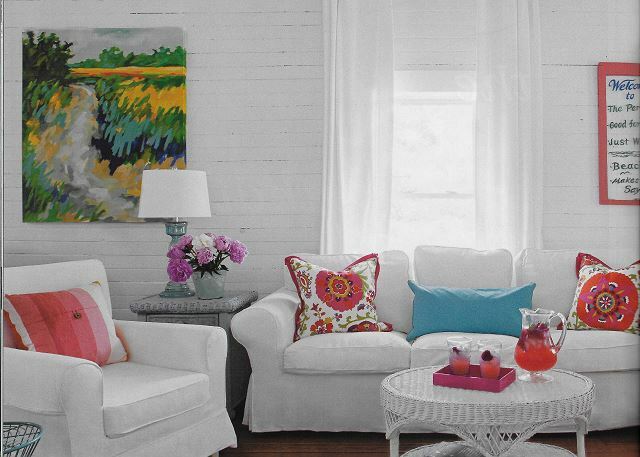 The interior of this cottage is precious! The kitchen is fully stocked with all necessary items.We found the beds very comfortable and the sitting area fit all of us..We loved the porch and spent a lot of time there with our 20 month old grandson. The walk to the beach was about a 5 minute stroll and the park next door to the house was great for taking a walk or for the little one to play on the fun children's area.i hope to get another appointment with Doc Holiday in the future."